Welcome to Loud ‘n’ Proud – the linky that says, yes, pride is OK! We don’t have to be self-deprecating all the time, you know. Sometimes it’s nice to shout about things and say, ‘Yes, actually, I AM really proud of that!’. And why shouldn’t you be? Sometimes being a parent is pretty hard work. It can be miserable and repetitive. Sometimes you’d just like a day off. But then sometimes something amazing happens – first steps, a lost tooth, a starring role in the school assembly, a goal, a try, a certificate… You get the picture. Those things. Those things are worth recording and remembering. Because they more than make up for the tedium, the frustration and the exhaustion of parenting. I’m perfectly OK with saying I’m proud. My kids do some amazing things. They pass tests, they walk mega distances, they perform in pantos and dance shows (OK, that’s just one of them) and they score the goals and the tries. And I want to remember those things. What better way to remember them than to write them? This week I’m feeling proud because my eldest is finally being nice to his sister. Believe me, that is something which never happens! So if you’ve got one of those moments to share – an achievement however big or small, please add them to the linky below so we can all enjoy them. There’s a badge to grab too if you would like! 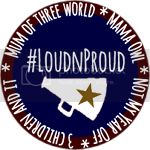 Loud ‘n’ Proud is hosted by yours truly, 3 Children and It and Mama Owl. Next week it will be back with 3 Children and It. Please make sure you take the time to read and comment on some of the other posts. All linked up, thank you for hosting!